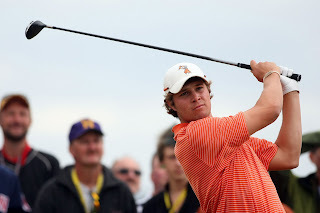 Peter Uihlein during last year's championship run in the U.S. Amateur. Photo courtesy of McClatchy-Tribune News Services. Former IMG Academies standout Peter Uihlein is one step closer to etching his name into the same record books as golfer's like the legendary Bobby Jones and Tiger Woods. Uihlein crushed South Africa's Dylan Frittelli 5-and-4 in the round of 32 matches at the 111th United States Amateur on Thursday. Uihlein, a rising senior at Oklahoma State University, is the defending champion and is trying to become the first player to win back-to-back titles in the event since Woods completed a three-peat from 1994 to 1996. Jones accomplished the feat twice, winning in 1924-25 and 1927-29. Uihlein took his first lead on the seventh hole and didn't look back against Frittelli, winning five consecutive holes - Nos. 7-11 - before closing the match out on No. 14 at Wisconsin's Erin Hills layout. Uihlein is an honorary member at the Ritz-Carlton Members Golf Club in Lakewood Ranch and visits Manatee County on occasion for some tune-ups with IMG Leadbetter Golf Academy director David Whelan, who also teaches the LPGA Tour's Paula Creamer, LET rookie Jaclyn Sweeney and Nationwide Tour and former PGA Tour player Casey Wittenberg. Uihlein tees off at 7:40 a.m. (local time) on Friday, and will face a difficult opponent in his attempt to book a quarterfinal spot for later that afternoon. Uihlein's opponent is Scott Langley, who recorded a 4-and-3 victory over Canada's Mitch Sutton. Langley wrapped up his collegiate career at Illinois last spring and claimed the NCAA Individual Championship in 2010.